In March 2018, Alliance for Truth about Comfort Women sent its delegation to Geneva, Switzerland to attend the United Nations Human Rights Council, taking advantage of the UN consultative status of the International Career Support Association. 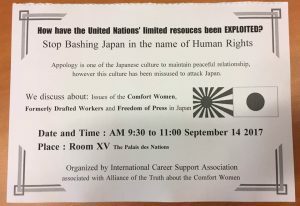 At the UNHRC, Sharon Isac of the Alliance gave a speech calling the historical accounts of comfort women “depraved highly defamatory myth.” In addition, former member of the Parliament Takashi Tanuma (田沼隆志) simultaneously refuted the UN Special Rapporteur David Kaye’s report describing curtailing of press freedom in Japan by the government and also argued that there is a pervasive censorship of any conversations critical of China or Korea on the internet. In September 2016, Alliance for Truth about Comfort Women sent its fourth overseas delegation to Geneva, Switzerland to attend the United Nations Human Rights Council and to meet with officials at the UN Educational, Scientific and Cultural Organization (UNESCO) in charge of the agency’s Memory of the World Register. At the UNHRC, Nobukatsu Fujioka of Japanese Society for History Textbook Reform gave a two-minute speech, taking advantage of the UN consultative status of the International Career Support Association. In addition to the formal delegation, the Alliance for Truth about Comfort Women recruited members of the public to accompany the delegation for 268,000 yens each. Paying tourists were offered opportunities to enter United Nations functions as members of the International Career Support Association. 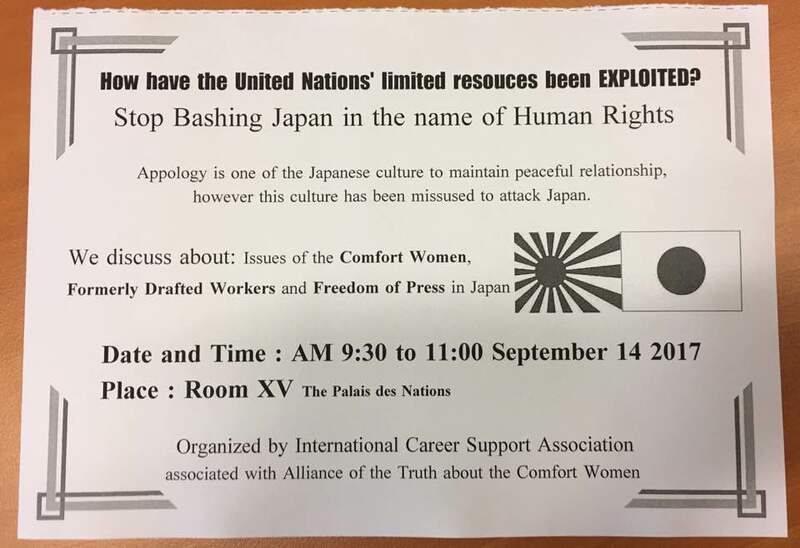 In September 2017, Alliance for Truth about Comfort Women and its affiliated groups sent its delegation to Geneva, Switzerland to attend the United Nations Human Rights Council, taking advantage of the UN consultative status of the International Career Support Association. Shunichi Fujiki spoke in a meeting about press freedom to accuse the U.N. Special Rapporteur David Kaye’s report critical of Japanese government of “bias,” while Mio Sugita attacked the government of South Korea for financing anti-Japan propaganda and “brainwashing” its citizens to foster hatred toward Japan. Australia-Japan Community Network (AJCN) is a group formed by Japanese residents in Australia in opposition to an effort by Korean community to establish a comfort women memorial in Australia. The leadership of the group includes Tetsuhide Yamaoka (山岡鉄秀), the President (who actually lives in Japan), and Sumiyo Egawa (江川純世), the Secretary-General. Under the leadership of Yamaoka, AJCN pursued a two-faced strategy emphasizing in English the need for harmony among various ethnic communities in Australia, while in Japanese it boosted comfort women denial and anti-Korean racism. The two-faced strategy was apparent when AJCN criticized in English that Korean community’s effort to erect a comfort women memorial because it “threatens to undo” Japan-ROK Agreement (2015), while in Japanese it bashed the agreement and called for its nullification. Egawa even bragged about this “innovative” strategy in social media in Japanese. After Yamaoka returned to Japan, the group began publishing more transparently denialist and anti-Korean articles in English as well, such as “why do Korean children bully Japanese children?”. AJCN’s complaint was dismissed in January 2017, but the organization filed yet another complaint with the Australian Human Rights Commission.